“Super Yosakoi” born in 2001 is the biggest Yosakoi festival in the metropolitan area to be held on the last Saturday and Sunday in August, for dedication festival of Meiji Jingu Shrine. 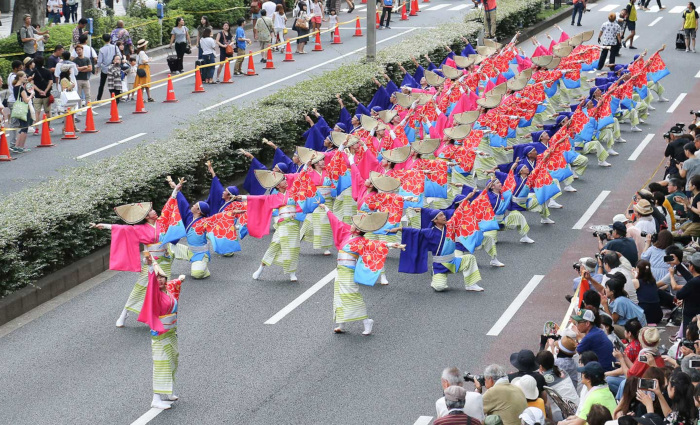 Approximately 100 teams from all over the country, about 5,500 dancers participate, perfect-match performances will be shown at Meiji Jingu Shrine, Yoyogi Park and Omotesando avenue. At Yoyogi Park Event Plaza, a popular event “Gyoza Fes (Dumplings Festival)” will be held where you can taste dumplings throughout the country.